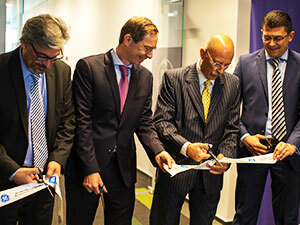 BUCHAREST, ROMANIA – August 30, 2017 – GE (NYSE: GE) speeds up growth for its software and digital resources in Romania and kicks off the recruitment campaign for GE Power's Grid Software Solutions (SWS) center in Bucharest. The company intends to hire highly skilled IT specialists in the coming years. Available jobs range from middle to senior positions in technical leadership, software integration and SCADA (Supervisory Control and Data Acquisition) software engineering. The SWS center was established in 2011 as part of the global Grid Solutions (SWS) center of excellence. GE Power's Grid Solutions serves customers globally with over 19,000 employees in approximately 80 countries. The Grid Solutions business helps enable utilities and industry to effectively manage electricity from the point of generation to the point of consumption, helping to maximize the reliability, efficiency and resiliency of the grid. "Our Software Solutions center plays a significant role in achieving GE's mission to become a Top 10 software company in the following years," stated Cristian Colteanu, President & CEO GE for Romania, Bulgaria and the Republic of Moldova. "As Romania is turning into the digital center for South Eastern Europe, digitalization has become a major asset for driving value and efficiency in the local energy industry." "We're very excited about the accelerated growth of our Romanian SWS center, in a highly competitive, fast-growing IT market. Since 2015, we have hired over 100 people and are committed to keep the same pace and continue the recruitment of digital specialists over the next two years," stated Silviu Cretean, Senior Services Director for GE's Software Delivery Center in Bucharest. Starting August 2017, employees will be welcomed in the center's new state-of-the-art headquarters on Aviatorilor 8 – the most high-tech and sustainable office building in Romania. GE's working space will cover around 3,000 sqm on the 1st and 3rd floors, and will benefit from all the building's cutting-edge facilities – from electric car chargers, to showers and locker rooms, and over 200 parking spaces. The current team of 130 specialists at the GE Grid Software Solutions center provides technical support worldwide for projects such as integration, software development and testing. Moreover, the center is a major contributor to energy grid stability enabling energy providers to respond quickly to grid demand fluctuations and to ensure security of energy supply. GE's team contribute to the advancement of computer systems for major players in the energy markets of Europe, North and South America, Australia, Africa, and the Middle East, while also providing on-site services and currently delivering on most of GE's portfolio for EMS (Energy Management System), DMS (Distribution Management System), MMS (Market Management System) and Asset Management. This year, GE celebrates more than three decades of business in Romania. The company's history dates back to 1984 when GE provided turbo-generator units for the Cernavoda Nuclear Power Plant. Today, all GE businesses are present in Romania, and almost 1,000 employees support customers in the country and abroad.